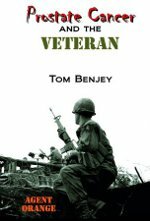 Page 110 includes headshots of soldiers who played on the Camp Funston (Fort Riley, Kansas) football team in 1917. Number 29 is Pvt. Thomas Hawkeagle (aka Pretty Boy and Hawk Eagle). Nothing further could be found about him in the book but it is well known that he played on the 1914 Carlisle team and distinguished himself so much against Auburn that he figures prominently in the legends of the origin of the War Eagle cheer. 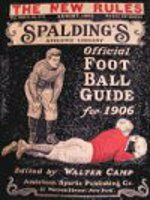 Hawkeagle was the last Carlisle player mentioned in the 1918 Spalding Guide for activity in the 1917 season. There were likely others but they weren’t mention by Spalding or I just missed them. John Flinchum was listed on page 224 as the captain of the 1918 team, playing at left tackle. No coach was listed for 1918 because none had been hired at that point. Non-players in the form of officials were listed in the back of the book on pages 233 through 249. Officials were separated into various groups: collegiate, service and scholastic, as well as by region, state or conference. Southern Officials were grouped by white and colored. Even the officials that were set apart as being active-duty military had this separation even though the Service Officials did not. Indians were not segregated from other officials as Indian players had been allowed to play on otherwise all-white teams for many years. Oddly, only one former Carlisle player was listed as an official and that was Mike Balenti. The advertisement for Warner’s 1912 book was still being run in the 1918 guide. This time, it included an anonymous testimonial for “The coach of an unbeaten Western college” who was surely Lone Star Dietz whose Washington State team had gone unbeaten in 1917. Dietz’s team was not invited to the Rose Bowl that year because military teams were drawing large crowds at that time. Dietz and his players would be invited at the end of the 1918 season but that time they wore Mare Island Marine uniforms. 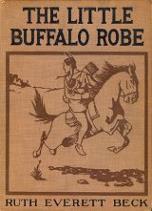 Apparently, raising cattle wasn’t a very profitable undertaking at that time on that land because the Carlisle superintendent requested that the Cheyenne River Agency superintendent find him employment: “Thomas has made a most excellent record at Carlisle and it is hoped an opportunity will present itself to put him to work where he can earn ready cash while caring for his property.” Upon Hawkeagle’s arrival, the agency superintendent responded, “We will do all we can to find work for him but as there are no vacancies in the regular force any employment given to him would be of irregular nature and temporary only.” About a year later, in October 1916—after the cattle were fattened, one assumes—the Cheyenne River Agency superintendent wrote Ford to reinstate Thomas. That attempt was not immediately successful because the Chief Clerk at Carlisle wrote Ford recommending that they hire him. In ensuing correspondence, Superintendent Oscar Lipps gave Thomas a good recommendation. It is not known if he ever got back on at Ford or not, but it seems unlikely because he registered for the WWI draft at Cherry Creek, South Dakota. Tribal rolls indicate that Thomas Hawkeagle was born in 1894. However, his WWI draft registration has his date of birth as April 14, 1893. Birthdates are often fuzzy for people born in that time period. The 1920 Federal Census lists him as a single head-of-household living with Margaret Wolf (55), his widowed aunt, and her daughter, Nellie Wolf (16), his cousin. 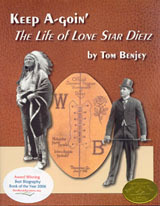 The 1920 tribal census lists him as married to Nellie. In 1921 they are also listed as married with son Claude born on August 4, 1920. The 1937 roll, the last one available to me, lists Thomas and Nellie as having four children: Claude, Ben H., Sylvester and Irene Matilda. Beginning with the 1927 roll, his family name was shifted to Eagle Hawk. And this is all I know about the man who was once called Pretty Boy. On April 30, 1915, Thomas Hawkeagle’s request to be allowed to drop his academic work and spend all day learning and working at his trade was turned down. The reason given was that, with only two weeks of school remaining, it wouldn’t be to his advantage to miss the final examinations and likely not be promoted. On that same day, he filled out paperwork to determine his eligibility for Federal aid. Given that he was an orphan with no income, he was probably deemed eligible. He owned 320 acres of land and would inherit land from his mother, but that didn’t provide immediate income. He may have wanted to be released from academic work early to allow him to leave for Detroit two weeks earlier than he would if he completed the school year. He may have thought the opportunity with Ford Motor Company would disappear if he didn’t take advantage of it immediately. It didn’t. Thomas Hawkeagle and several other boys from Carlisle Indian School spent most of the spring and summer learning how to make Model Ts. After successfully completing their apprenticeship, they would be eligible to earn wages twice what other employers paid. From all accounts, he performed well and enjoyed working at the Highland Park Plant. At the start of the school year, he and the other football boys returned to school. Hawkeagle was finally a starter on the football team, but changes made in the wake of the 1914 Congressional Inquiry deemphasized athletics and band, dooming the team to no longer be competitive at their previous level. The team’s dismal 1-3-1 record may have had something to do with his mid-season departure, but the stated reason was to return home to his ranch to “care for the stock that has recently been issued to him.” But that wasn’t the last Carlisle would hear of Thomas Hawkeagle. Next time – Part five of Pretty Boy’s tale. A May 4, 1915 letter from Superintendent Campbell of the Cheyenne River Agency to Oscar Lipps, Superintendent of Carlisle Indian School, stated, “…you are advised that Pretty Boy and Thomas Hawk Eagle represent one and the same person.” Carlisle officials continued to call him Thomas Hawkeagle as they had always done. 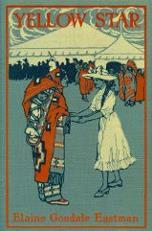 The 1914 contest with the Carlisle Indians provides another story. The toughest player on the Indians’ team was a tackle named Bald Eagle. Trying to tire the big man, Auburn began to run play after play at his position. Without even huddling, the Auburn quarterback would yell “Bald Eagle,” letting the rest of the team know that the play would be run at the imposing defensive man. Spectators, however, thought the quarterback was saying “War Eagle,” and in unison, they began to chant the resounding cry. The problem with this explanation is that Carlisle had no player named Baldeagle or War Eagle. However, as we know, Hawkeagle was on the team. 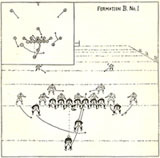 The Washington Post coverage of the game reported that Hawkeagle substituted for Hill at left guard in this game. Hawkeagle could have been misunderstood as War Eagle. Thomas Hawkeagle may live today if this attribution of the legend is true. Next time – Part four of Pretty Boy’s tale.